The Industrial Revolution had the the most prolific inventor of all time... Thomas Edison. Thomas Edison had more than 1000 patents for his inventions. How do his inventions affect us today? 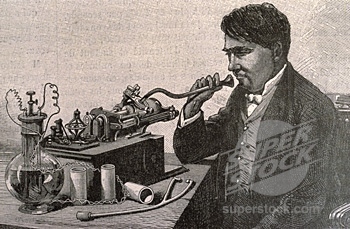 Click on the photo of Edison for a webquest link, which will show students how they can solve the mystery of how modern day machines, gadgets, or objects is connected to an invention created by Thomas Edison. Students will first complete research (using their critical thinking skills) and write an Inventor's Journal that will document their researched evidence and conclusion (connection to Edison). Once students have researched the inventions and their backgrounds, students will create their own invention. Click on the photo of Edison to view the webquest!